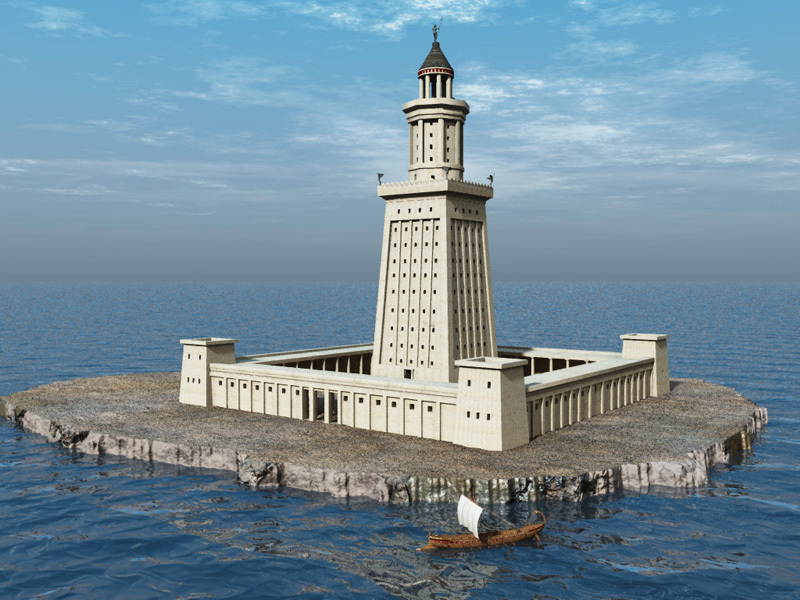 The Lighthouse of Alexandria is one of the wonders of the Ancient World. It was still a great tourist attraction well into the medieval period, and was visited by many travellers to the city that were impressed by its magnitude. 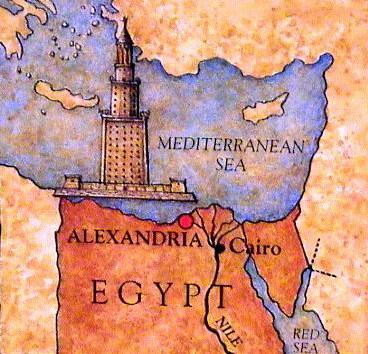 The lighthouse was constructed in the 3rd century BCE during the reigns of Ptolemy I (Soter) and his son Ptolemy II (Philadelphus). It has been said that it was seriously impaired by number of natural disasters between 10th and 14th Century, eventually collapsed completely and last of it remains castoff in the construction of the Citadel of Qaitbay (Kait Bey) dated back to late 15th Century. It lasted for a long time as one of the ancient wonders, alongside with the Mausoleum at Halicarnassus and the present Great Pyramid of Giza. 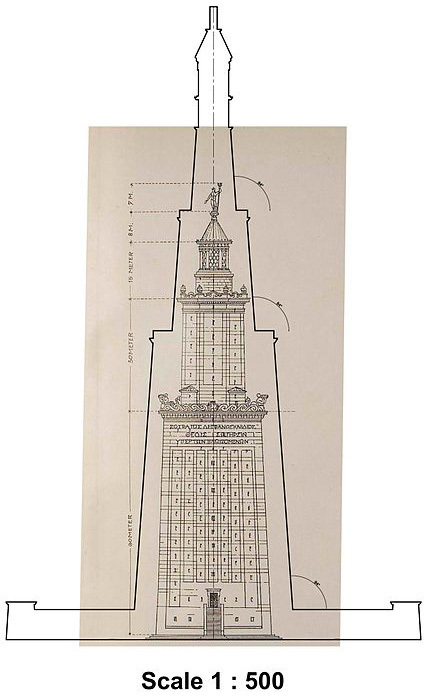 There are very different opinions on the height of the lighthouse (as seen on the figure below). Because of different views, its size varies dramatically; to an extent the number roughly changes between 100 and 200 meters high. 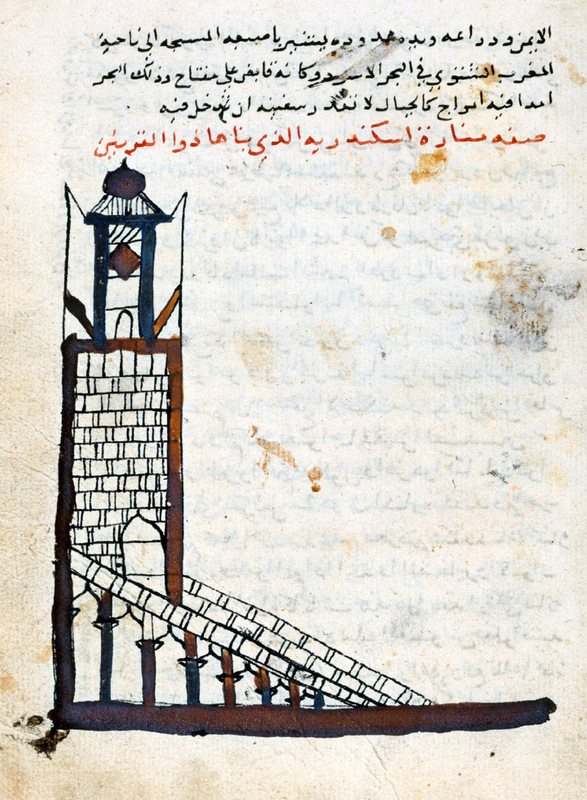 Size calculations were mostly based on the witness records of travellers from Muslim World. 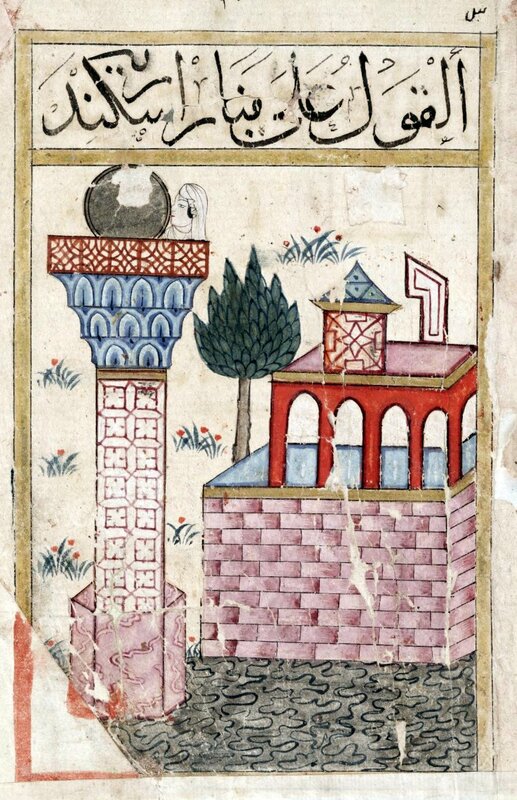 For example, according to Judith McKenzie, "The Arab descriptions of the lighthouse are remarkably consistent, although it was repaired several times especially after earthquake damage. 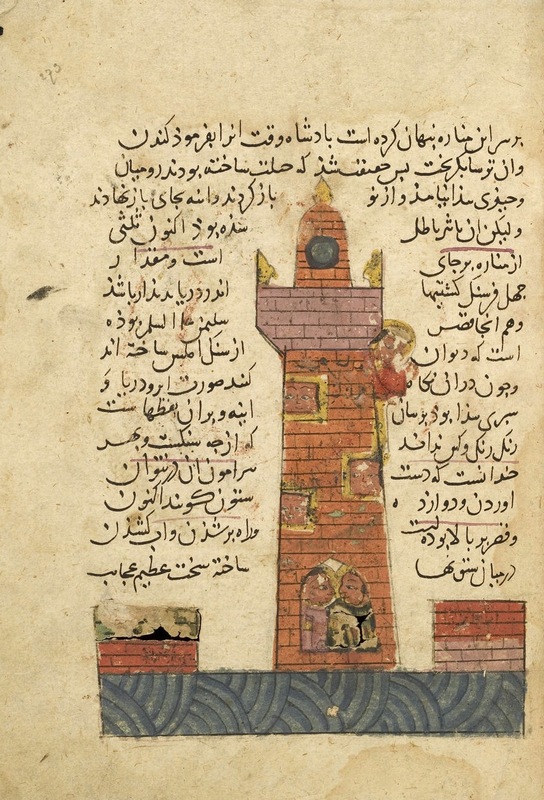 The height they give varies only fifteen per cent from c 103 to 118 m [338 to 387 ft], on a base c. 30 by 30 m [98 by 98 ft] square... the Arab authors indicate a tower with three tapering tiers, which they describe as square, octagonal and circular, with a substantial ramp"
The lighthouse was particularly admired and often visited and described by people from Islamic civilisation. 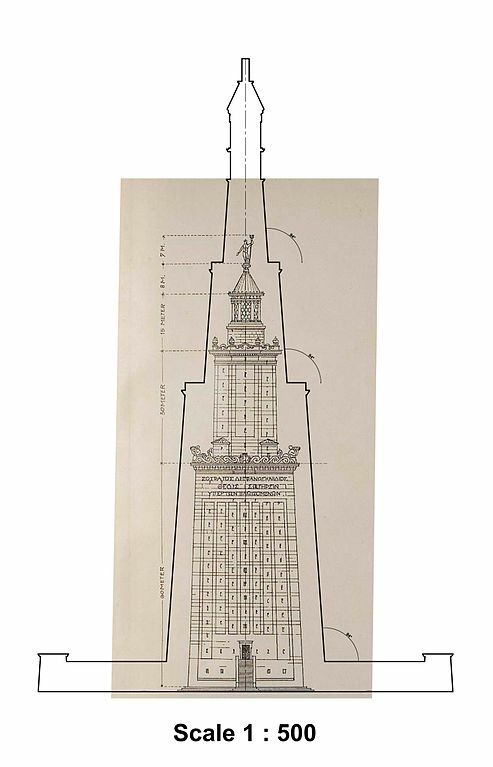 This could be due to partly of its mighty size, but perhaps also because of the interest in its technology as seen in the function of its mirrors. 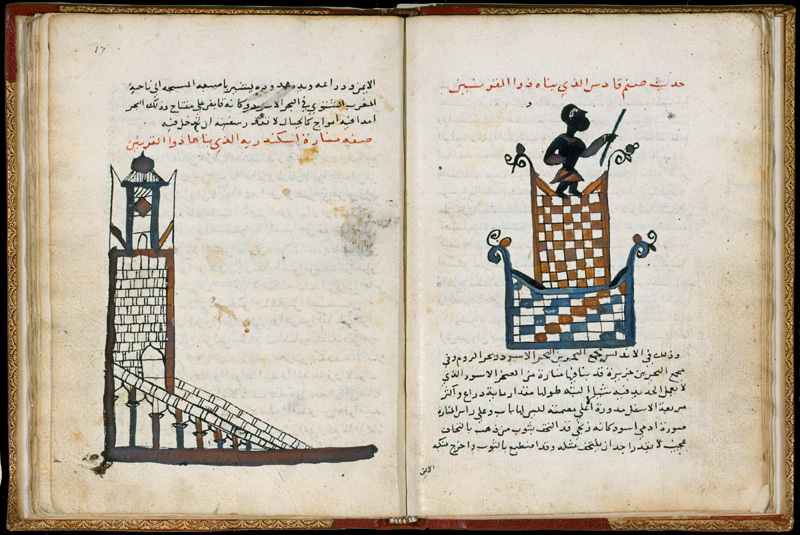 Although pre-Islamic sources are rare, writers from Muslim World provided more records of its detailed description and configuration along with tales and legends. One of the greatest wonders that we saw in this city was the lighthouse which Great and Glorious God had erected by the hands of those who were forced to such labour as 'a sign to those who take warning from examining the fate of others' [Quran: 15:75] and as a guide to voyagers, for without it they could not find the true course to Alexandria. It can be seen for more than seventy miles, and is of great antiquity. It is most strongly built in all directions and competes with the skies in height. Description of it falls short, the eyes fail to comprehend it, and words are inadequate, so vast is the spectacle."